“Should” is a useless word. There’s something that’s been bugging me for a while now. I couldn’t quite put my finger on. I couldn’t name it, so it just sort of floated around in the back of my brain like a dragon fly, darting this way and that, sometimes getting right up in your face, then skittering away whenever you swat at it or grab for it. And some of these people even find their way into office in this country. And they start making laws and enacting statutes and directing policy to bend things to the way they say they “ought to be”. Trouble is, things are what they are, and changing them around isn’t so easy as that. Especially when the things are people. Before I get too carried away, let me wander back to the point. My leisure reading the last two weeks was Delilah S. Dawson’s Hit, a YA dystopian thriller about a future where banks have seized control of the country and are forcing children to become debt-collecting hitmen. I read that. And all of a sudden, that dragonfly in my brain stopped skittering, landed on a lonely dendrite, and took root. “Should” is a useless word. Yet it’s one we use all the time. “I should have gotten up earlier.” Yeah, I should have, but I didn’t — so what am I going to do about it? “People shouldn’t steal.” Yeah, they shouldn’t, but they do — so what are we going to do about it? “He shouldn’t have even been there.” Yeah, but he was — so what are you going to do about it? See what happens there? Any time somebody says “so-and-so should …” there’s an automatic “but” followed by a “so what” that comes in response. “Should” seems more and more to me like the refuge of the coward. It says, “I don’t like this situation, so instead I’m going to talk about what I would rather it had been (yikes, grammar is hard when you get rid of “should”) without doing anything about it.” And yeah, sometimes the “should” statement is followed by action, but a lot of times, it isn’t. A lot of the time, we just say “well, it should be this other way” and we leave it at that. For that matter, a lot of what people go around “shoulding” about has nothing to do with them. “Gay people shouldn’t get married.” “Women shouldn’t be in those jobs.” “He should take better care of himself.” None of which has anything to do with the person saying it. We have a rule in my house and in my classroom. Rule #1. MYOB. Mind Your Own Business. The fact is, people use “should” to hide from things they don’t like, from things that make them uncomfortable, from things that scare them. They use “should” to build a fantasy world in their heads. A make-believe universe where things are perfect, unoffensive, unscary. “Should” represents a fundamental failure (or, worse, refusal) to see the world as it is in favor of how we expect it to be. But the “shoulding” doesn’t do a damn thing. Things are what they are, and all the shoulds in the world won’t change them. What changes things is action. You can take action without griping about how things “should” be first. Address things as they are, recognize that there is no such thing as “perfect” (because the world we live in is messy and filled with other people who don’t automatically agree with you) and work to make things better. Don’t waste your time moaning about the way things “should” be. Get to work on fixing what’s wrong. Teaching is one of those jobs that carries all kinds of asterisks and disclaimers. And it’s not a job for the faint of heart. But one thing it has going for it — that not many jobs do — is an enforced sense of renewal and rebirth. You come away from the school year, in other words, covered with their gunk. And not just the students’ gunk. Gunk from other teachers and their frustrations that you have to listen to in the workroom, the mailroom, before the faculty meeting. Gunk from the seemingly endless meetings, by the way, that could have been e-mails. Gunk from the unpleasant encounters you had with parents, from the stress about the extra time you had to spend in the building at the expense of your family time, from the piles and piles and piles and piles of paperwork. But teachers get that summer break. And what I’ve learned in my eight years (help!) of teaching is that it’s a rare educator that comes back in the fall still gunked-up. The summer lets you really clear your head, lets you drop all the baggage of the previous year — the gunk, bit by bit, just falls away. We get to start the new year, every year, clean and fresh. Maybe not smiling and bright-eyed (we’re out of the habit of waking up early after all, but this is why coffee exists), but at least optimistic that the year ahead could be a good one. Maybe we make some changes to the way we run things; maybe we don’t. Maybe we’ll have a magic combination of minds in our classes that makes every day teaching a joy; maybe we won’t. But whatever the new year brings, we get a chance to start it un-gunked. Clear-headed. Renewed, reborn. Maybe even a little bit hopeful. My first students will breach the doors in a little under an hour. To those about to teach, I salute you. So we’re back from a week-long vacation in Canada. But at the moment — maybe because I’m returning to home, and by extension to normality — I’m a little preoccupied with food. Partly because we had to visit the grocery store and buy food that we’d be preparing ourselves for the first time in a week. Partly because, since we hadn’t been preparing our own food for a week, that meant we’d been eating exclusively in restaurants — i.e. eating like garbage. But mostly because — to put it bluntly — food in Canada is weird. To loosely quote John Travolta in Pulp Fiction, they have the same stuff over there that they have here, but it’s just there it’s a little different. And look, I’m not a foodie or anything; even typing that word makes me feel like a pretentious tool. I have no doubt there are intricacies at play here that I am oblivious to. That’s okay. Like any good American, that won’t stop me from voicing my displeasure. That’s right, displeasure, because just one week was enough for me to get sick of some of this stuff, so I can only imagine what it must be like living there full-time. There are three primary offenders: Poutine, Donair (or donairs? I’m not even sure) and Dulse (which looks and sounds like it should be spelled with a “c” but it isn’t because this is Canada and they don’t care about such things — they can’t even decide on a national language for goodness’ sake). Let’s start with the least offensive: Poutine. Poutine is actually delicious, even if it doesn’t sound like it would be at first: you take standard-issue French Fries, smother them with gravy, and melt a bunch of cheese over the top of the whole thing. Why this little treat hasn’t caught fire in America is beyond me. It’s salty and satisfying and indulgent and sits in your stomach like a brick after you’ve eaten it: comfort food of the highest order. But it’s still annoying, because like anything good, it’s saturating the culture. Poutine is everywhere, from burger joints to fancy restaurants to food trucks and everything in between. Well, you might say, french fries are everywhere in America, isn’t that the same thing? Yeah, sure, if chihuahuas and Great Danes are the same thing. But you can’t compare poutine to french fries like that, because french fries are adaptable: you can put them on a plate, toss them in a cup, funnel them into a newspaper fan, whatever. 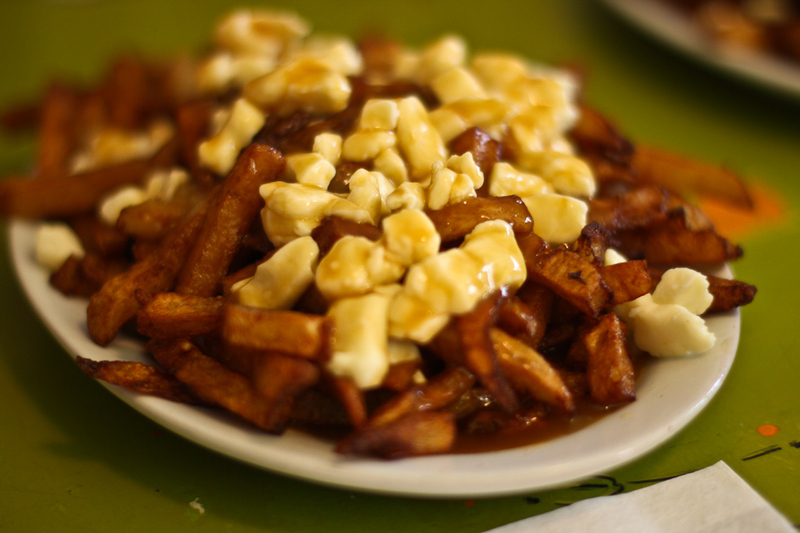 Poutine comes exactly one way: on a plate, and anything else is a catastrophe. Which means that the poutine you get at, say, McDonald’s, comes served pretty much the same way as it might at a classier joint, which has the effect of making you feel like a schlub for ordering it in a classier joint. Let’s also point out that having a runny, slimy food like this available at a fast food place totally defeats the purpose of eating at a fast food place, because poutine is not a food that can be eaten quickly or cleanly or when time is any sort of factor. Try and eat poutine with your lunch combo when you’re running late and you will arrive back to work doused in gravy (which, I dunno, maybe that’s your thing, in which case, Canada may be for you). In short, delicious, but so ubiquitous you’ll be tired of it after a day. Then, there’s donair, or donairs. Donair seems to be a concept as much as it is a thing. (By the way, it’s pronounced like “donut” except instead of a donut, you have donair — and that’s where the similarity ends.) Because you can go to places (usually sandwich shops, but often, strangely, pizza places) and order donairs, but you can also find “donair sauce” on store shelves and in recipe books, and in the same way, “donair meat”. “Donair meat”, by the way, is not the meat of a donair (some rare Canadian beast) but rather meat for a donair. What type of meat is it, then? This is the question that, when you ask it (and well, I think, you should ask it) a Canadian will look at you oddly and reiterate, “it’s meat that goes in a donair”. This happens to be a thing Canadians just do, on a lot of subjects, not just donairs. You ask them a question and get a circular answer. (“Where is the cave?” “It’s in Saint Martin.” “Where’s Saint Martin?” “It’s down by the caves.” When you look at them oddly, they just look at you oddly right back until one of you apologizes (usually the Canadian, because if there’s one thing they do well and fast, it’s say “sorry”). You slap the “meat” and the “sauce” together with some tomatoes or peppers into a toasted pita, and bam, that’s a donair. In other words, it’s basically a weird gyro sandwich. Except I didn’t know this, so the first donair I had was in pizza form, which might be adding to my overall confusion about the whole thing. Then, later in the week, one of our hosts brought home some donair fixings and made up basically a sauceless pizza topped with donair meat to dunk in donair sauce. This I ate, and it was slightly better than a “donair pizza”, but it did nothing to aid my confusion about donairs. I didn’t fully understand what a donair was supposed to be until I got back to America and googled it. In short, when a Canadian tries to tell you about an exciting food they want you to try, do your research first. Third, and most offensive, is Dulse. Do not make the mistake, as I did, of associating “dulse” with “dulce”, as they are not the same thing, and the fact that they seem to have the same root is a bug, not a feature, of language. That’s all. It’s seaweed. They dry it out and salt it, and then they eat it. Like potato chips, but horrible. It’s somehow simultaneously crispy and chewy, tough and brittle, all at once. You put it in your mouth (your first mistake) and the edges of it immediately flake off and melt to the inside of your cheeks and gums, while you have to keep working the main “leaf” like a piece of jerky. It tastes like fermented fish urine, which it basically is, because it’s seaweed. I pointed out to the Canadian who tricked me into eating dulse that it tasted, in fact, exactly as you would expect dried-out seaweed to taste, and she responded, “no, it tastes like dulse.” My inclination was to argue the point by asking her what, exactly, dulse was, but the donair incident was fresh in my mind so I just smiled and refused another piece. My wife’s grandmother picked up a bag of it in Market Square in Saint John. Very excited about it, too, she was. As it turns out, Saint John is a tourism stop for cruise lines sailing in the Northeastern U.S. and Canada, and a cruise ship happened to be in port that day — so the square was flooded with tourists. Mostly Americans, so I didn’t feel quite the fish out of water that I usually did. I was just working my way through my first (and only) piece, the fish-pee taste slowly spreading across my tongue. Apparently, the expression creeping across my face didn’t deter them, so they said “sure” and took a piece. Two seconds later, one of them said, and I quote, “nope, that’s coming out,” and spit it RIGHT ON THE FLOOR, while the other rushed to the nearest stall to purchase an overpriced Pepsi to wash the flavor out. My grandmother-in-law watched this with a chuckle like she’d played some great prank on all of us, all the while stuffing the horrible purple stringy stuff into her mouth. You can buy this stuff by the bag, if you want, but I also saw it in spice form: a tiny, roll-of-quarters-sized tube which you could sprinkle over your steak or your breakfast eggs. You know, for when your food has that “fine, but not enough fish-pee” quality about it. 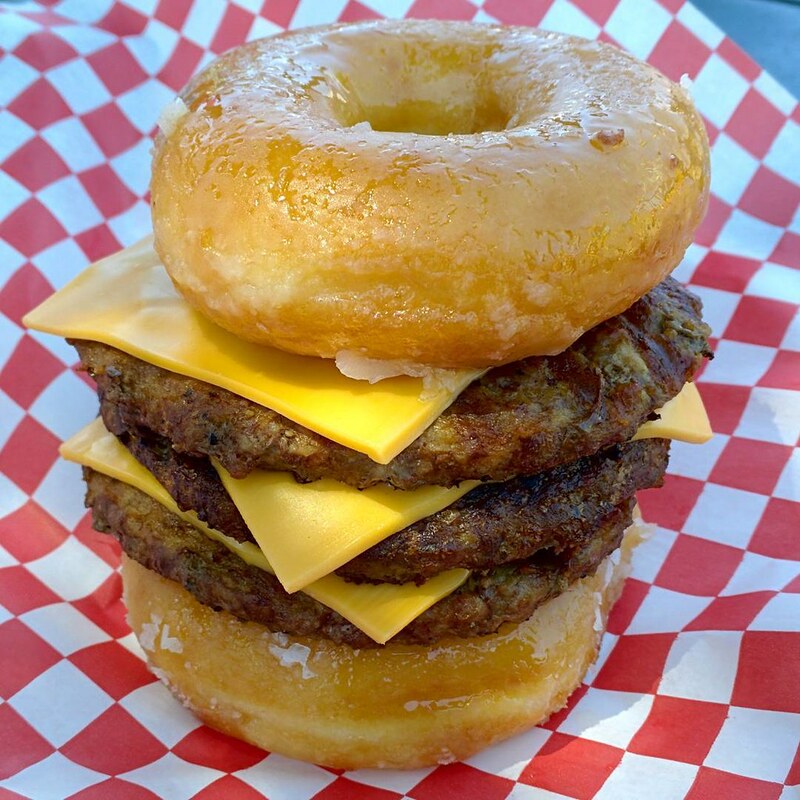 At any rate, these are only three of the most visible food faux-pas on display during my week in Canada. I’m sure there are others, and possibly worse ones (though if there’s something out there worse than dulse, I want it caught and shot). I will reiterate: if you’re going to try a new and exciting food while on vacation in Canada, do your research first. Thank goodness I’m back in the states, where we have NORMAL food. I am moving rooms today for the second time since being at my current school. Which is to say, as of next year, I will have been in a different location every year since I’ve taught here. (Future progressive verb tense is fun. English teachers, you feel me.) And that’s kind of a bummer. You get moved around every year, it’s tough to feel at home in your own classroom. Can’t put down roots. Can’t put your feet up too much. Like living in an apartment and never bothering to paint the walls because you’re gonna have to paint them taupe again when you move out, so why bother? I didn’t make this connection for my first couple years. up went the posters (dozens of them). Decorative lamps in the corners. Personal pictures and bulletin board borders and all. I even hung stuff from the ceiling tiles. Deep roots sunk into the earth of the place. Which takes forever to clean up and stirs up all kinds of emotions while you’re working for hours to do said cleaning. So, I don’t put down roots anymore. When I realized I could — and likely would — get moved at the end of the year, my personal touch became more of a tap. Just a couple of posters and only a few things in my own little corner of the room. The room writ large mostly blank or marked with a couple materials that we’re working with actively — to be pulled down again once we’re done. Yet even without those personal imprints, I feel more at home teaching in this school than I have in any of my other schools. So while the students are signing yearbooks and studying for finals (HAHA who studies for finals), I’ll be stuffing boxes. Happily. Peacefully. I might even enjoy it. Nope, that doesn’t help either. And some of them get pretty clever with their marquee. Credit where it’s due, I’ve gotten more than a couple of chuckles driving past this one particular church. But this is not chuckle-worthy. But it’s a joke that critically fails to understand the thing it’s poking fun at in addition to being just idiotically wrong. Because that isn’t the way evolution works. And evolution *is* true. Does that make me triggered? Does that make me a snowflake? Well, break out the flannel caps and snowshoes, because I have no patience for this. Claiming that evolution isn’t true is the sort of thing that really should carry a sociological cost, in this day and age. Like stepping into an NRA meeting and suggesting a government buyback on guns, or crashing an LGBTQIA support group and crowing that about Adam and Eve, not Adam and Steve. Claiming that evolution isn’t true, and telling kids to resist it in schools (I’ve encountered this myself actually, it really does happen), is holding us back. I’m not saying it should be illegal. I’m saying anybody seriously representing the idea should be embarrassed.